We are committed to bringing you only the highest quality human fuel, allowing for maximum human performance. We are strong believers that no one diet suits everyone, which is why we offer an array of organic whole food options to fit a wide variety of dietary needs. We neglect no specific diets, nor do we praise any one diet over others. We use whole food, organic ingredients from only the purest sources and you will be pleased to find a hearty selection of vegan, gluten-free, low sugar, Ketogenic & paleo options on our menu. All of our produce comes from organic farms & our animal products come from only the most properly fed & humanely raised animals available to Northern California (we offer Grass-Fed, Free-Range & Wild animal products only). From health tonic smoothies & vegan dishes to bone broths by the cup, we have something for you here! We aim to create an environment where our customers feel comfortable enough to take the time to talk, meet each other, & discuss new ideas that can help excel Sacramento into something truly special. You’ll find prayer flags in our hallway containing multiple theories & philosophies from different times and cultures, which still hold value today. You'll also find a floor-t0-ceiling wall mural depicting the powerful psilocybin mushrooms & Caapi Vines used to brew Ayahuasca (both of which are making their way into the public knowledge for their amazing potential in human growth). Even our logo (which you’ll see painted on the exterior of the cafe) contains hidden symbolism representing the kind of beacon we aim to send out to our Sacramento community. We'd like to invite you to come in for whichever reason you wish. Eat, drink, read, draw, collaborate, or just hang out and see where we can take Sacramento together! We sell t-shirts, sweatshirts, drink tumblers, & more! Grass-fed beef fed beef bone marrow topped with bacon jam & citrus fennel. Served with a grilled sourdough baguette. You’ll find green leaves all over the cafe. We love all plants! 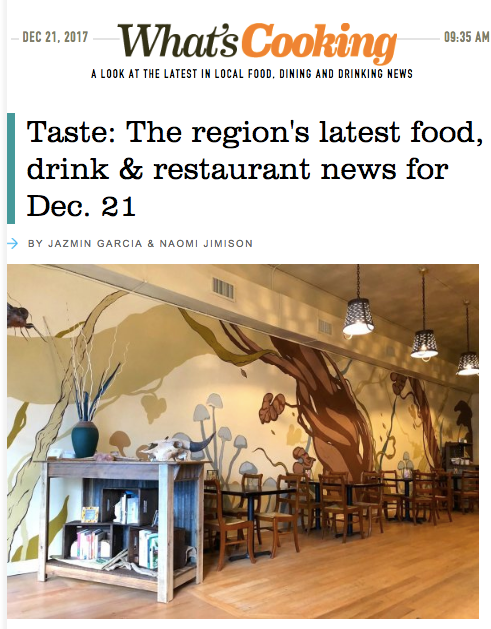 Sactown Magazine Features Backbone Cafe AS One Of The "Great New Places To Eat In 2018"
Need a space to host your work, birthday, holiday, Celebration Of Life, or other gathering? The cafe is available for special events! We offer a variety of catered menu options to suit a wide array of diets. Please use the form below to submit a request for event pricing & details for your event. We'd love to be a part of your special day to help make your catered event a huge hit! The cafe sells gift cards! Can't decide what to get your friends, family, or coworkers for their birthday or for the holidays? Show them you care by giving them the gift of a Backbone Cafe gift card! Gift cards can be purchased in any amount & are reloadable. You can even purchase electronic gift cards, which will be emailed directly to your recipient. Hassle-free gift giving, just the way it should be. Backbone Cafe opened in Dec. 2017 and is located in downtown Sacramento, one block from the Golden 1 Center. Since then, the cafe has gained a loyal following from citizens all over the Sacramento area & beyond. The cafe is owned by the Woolston family of Sacramento. The Woolstons have been in the restaurant business for over 30 years, first introducing themselves to the Sacramento scene when Matt & Yvette opened The Supper Club on Del Paso Blvd in 2002. An acclaimed seven-course fine dining restaurant, The Supper Club also served as a wine distribution & catering company known and loved by Sacramento diners & wine lovers alike. Brothers Joey & Tomas, only small children at the time, gained their early work knowledge of the restaurant business there. In 2009, Matt & Yvette opened Matteo’s Pizza & Bistro in the Arden area where Joey & Tomas began their first official work in the restaurant business. In 2012, The Supper Club moved out of its' Del Paso Blvd location and continued on as a catering company run out of The Crocker Art Museum in Sacramento. Joey & Tomas, both now experienced in the restaurant business, chose different paths throughout the industry. Tomas chose to excel in the Front of The House, while Joey chose the Back of House & kitchen. Tomas started as a dishwasher & table busser, eventually working his way up to management at all of the family's businesses. Joey began as a dishwasher & prep cook and worked his way up to Private Event Caterer, Kitchen Manager, and Chef. In September 2016, Joey sustained a 30 ft. fall at Burning Man, fracturing his body in multiple places, including 2 fractures of his spine. As a result of his injuries, Joey received a large spinal fusion surgery, a long antibiotic cycle, premature surgical hardware removal, and 2 body braces that resulted in 9 months of atrophy. He was told he would no longer be able to continue his athletic pursuits in Thai Kickboxing & Mixed Martial Arts. With a difficult road to recovery ahead & a large gap of intensity missing from his combat sports, Joey chose to redirect his focus towards the same direction of health & wellness he had been so passionate about before. He was now on a new path as a business entrepreneur and creating Backbone Cafe was the obvious next step for him to take. Tomas, also passionate in health & wellness, was excited for the new project & eager to take on the role of Cafe Manager for Backbone Cafe. Joey, at home in a body brace for the year, had all the time he needed to design a well balanced menu for all health conscious and traditional foodies alike. In December 2017, the Woolston family opened up Backbone Café on J Street in Sacramento, CA. Now up and running, You’ll find both Joey & Tomas operating the café together on any day you decide to stop in. While we continue our paths towards health & wellness, we hope you choose to join us! Sign up with your email address to receive the latest updates, events & special deals. You’ll also be the first to receive invites to the cafe’s special events! We respect your privacy. We never redistribute any information provided to us by our customers.